Lead-free (Bi0.5Na0.5)0.935Ba0.065Ti1−x(Mn0.5Nb0.5)xO3 piezoelectric ceramics with excellent strain properties were prepared by conventional solid state reaction route. The effects of Mn/Nb on the structure and electrical properties of the ceramics have been investigated. The replacement of Ti by Mn/Nb induced a ferroelectric–ergodic relaxor phase transition with the degradations of the long-term ferroelectric properties. Near the ferroelectric–ergodic phase boundary, the electric-field-induced strain was significantly enhanced and reached the highest strain value of 0.37% (80 kV/cm, corresponds to a Smax/Emax = 463 pm/V) at 0.005 Mn/Nb addition. Temperature dependent measurements of polarization, permittivity, large signal piezoelectric constant and strain indicate that a reversible field-induced phase transformation from ergodic relaxor phase to ferroelectric is the main reason for the large strain response. 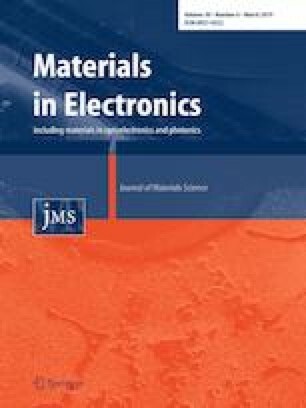 Moreover, due to the reversible field-induced phase transition, the material with high-strain showed good fatigue resistance (up to 105 cycles), which can be considered as one of promising candidate used in actuator applications. This work was supported by the National Natural Science Foundation of China (No. 21603092). The Science and Technology Innovation Foundation of Liaocheng University for College Students (No. 26312170513). The National Undergraduate Training Programs for Innovation and Entrepreneurship of China (No. 201710447029).